Carlson Design – Cushion Cafe: Made to Order, with Carlson! Custom cushions made to order, it sounds nice because it is! David and Iryna Newton of Cushion Café in Phoenix, Arizona have been manufacturing high-quality custom cushions and pillows for over 25 years. Cushion Cafe built their reputation producing high quality cushions for ANY piece of indoor or outdoor furniture, RV, or Boat cushion — regardless of size, shape, or unique challenge. With the implementation of their amazing new website (A MUST SEE), they have orders coming in from all over the US. 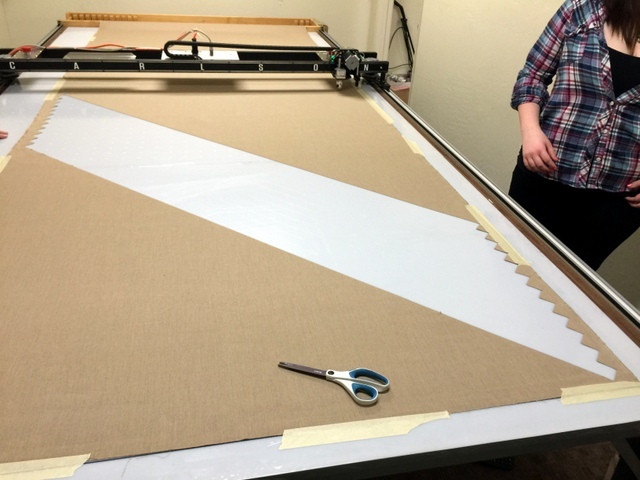 To meet the increased demand from online sales without adding space or personnel, they decided to automate their cushion cutting with a Carlson Design PT-72″ Plotter/Cutter with Hot Knife Tool Attachment. 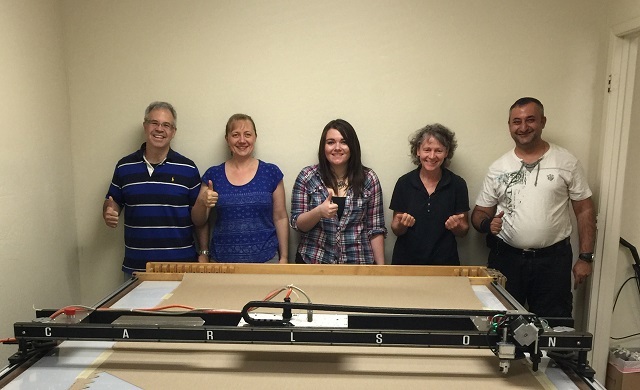 The Cushion Cafe team gives a big “Thumbs Up” with their new Carlson Design PT-72″ Plotter/Cutter. To maintain their quality guarantee they heat seals all of their acrylic and upholstery fabrics with a hot knife. By hand, this process is slow, tedious, and takes a skilled operator to maintain accuracy, speed, and a consistent sealed edge. Using the Carlson Design Plotter/Cutter with Hot Knife tool attachment, they can produce the perfect sealed edge, every time, to the exact size, with the least amount of material waste — at the click of a button. Their cuts are more square, faster — because of even speed, heat, and pressure, and always cut to the correct size. At Cushion Café, the person cutting a pattern is often the one sewing it. 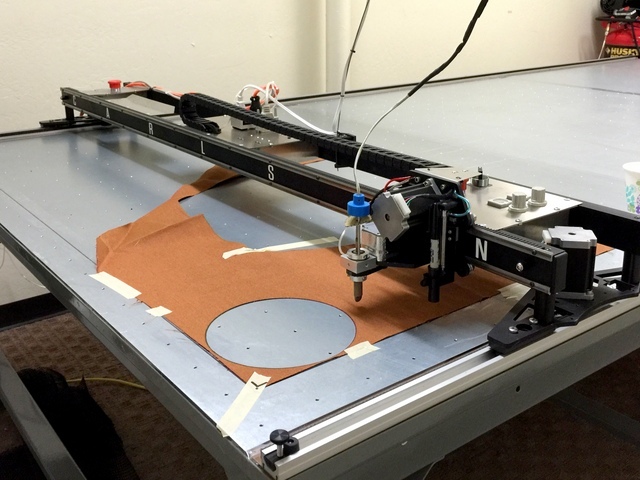 Automating their patterning, marking, and cutting allows the person previously doing their cutting to spend most of their time sewing, meaning they increase their production without hiring a new sewer. And, sewing is faster due to straighter cuts and more clearly marked seams. Complex patterns like a circle are very difficult to cut by hand. 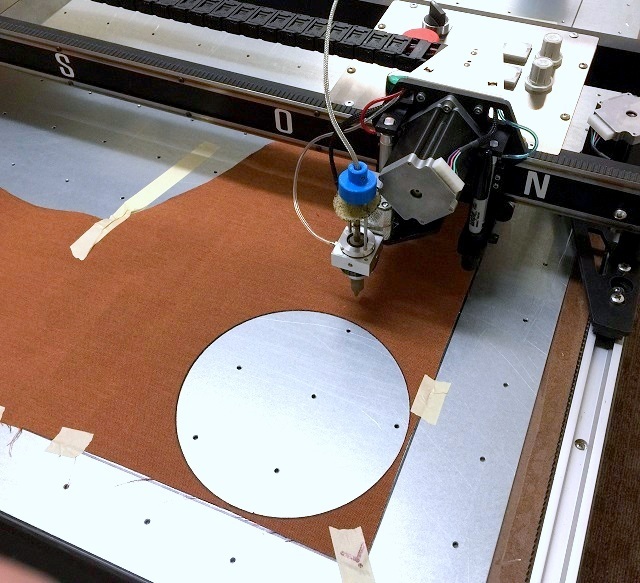 The Plotter/Cutter is the ultimate measuring machine, cutting the same perfect circle every time. Ordinary galvanized sheet metal tops the table for Hot Knife cutting. The sheets are drilled with 1/8″ holes on a 2″x2″ grid for vacuum. For material that doesn’t require a sealed edge – like welting – the banding on the edge of a cushion – Cushion Café cuts with our Rotary Knife. At over 30 inches per second, the roatyr knife cuts about 10x faster than the Hot Knife. Switching from the Hot Knife to the rotary blade is easy and only takes a few minutes. They also switch the cutting surface from sheet metal to HDPE to prevent dulling their rotary blades. Welting is tedious to cut by hand, but required in every job. It must be cut on the bias at a 45 degree angle. Cutting at 30IPS with the steel rotary blade, we reduced cut time from two hours to eight minutes! Cut on the bias at 45 degrees, welting is tedious to cut by hand, but required for every job. 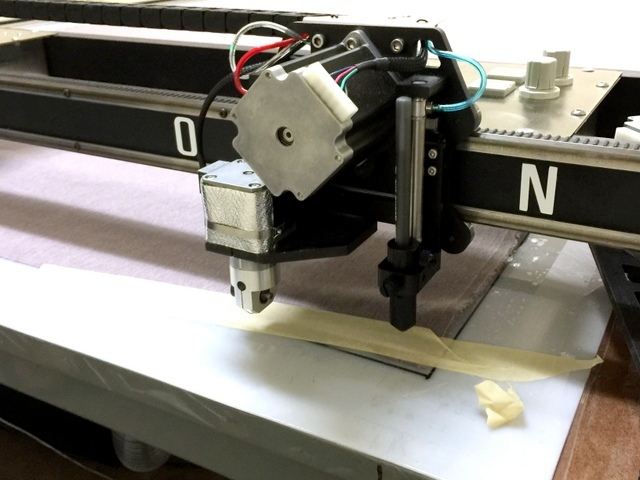 The Plotter/Cutter cuts 60 feet of welting in eight minutes! That would have taken hours by hand, with more material waste. 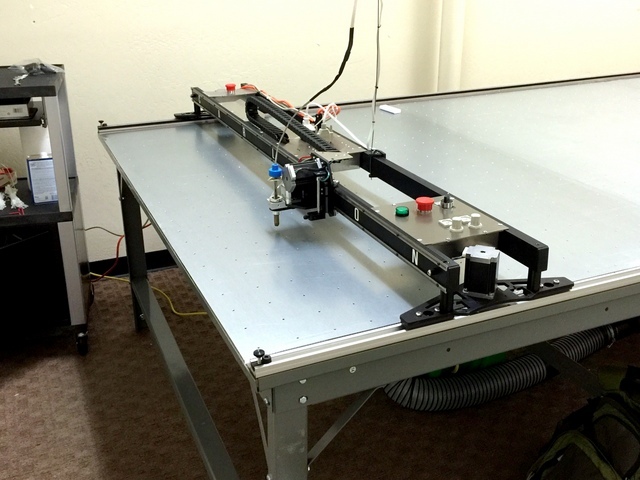 Our 6’x12′ Phillocraft vacuum table and operator’s workstation filled most of the cutting room. To make sure they maximized the cutting efficiency and minimize material shift we fitted one 1.5HP radial vacuum blower for each section of their three-section vacuum table. The sheet metal tops are used when cutting with the Hot Knife. This is not the only solution for cutting with the Hot Knife, but it is one of the simplest and most durable. The Operator’s workstation is a convenient cart with locking box to place the Windows PC to run the Plotter/Cutter. We provided the cart and they provided the Windows PC. 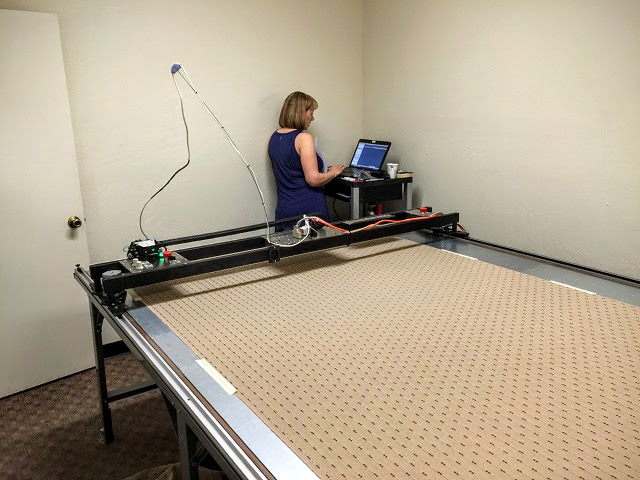 Iryna learns to operate her new Carlson Plotter Cutter. During our time in Phoenix David and Iryna were very welcoming – even inviting us out to watch bull riding and see some of the Arizona culture. Thank you both for everything – happy plotting and cutting in Phoenix!